On his way Ad Dominum, Thom is reflecting on vocations. At Shouts in the Piazza, Fr. Selvester – who happily gets to celebrate the Ascension of the Lord tomorrow - has some words of wisdom for those who try to “squeeze in” Mass on their lunch hour on holy days. Word comes to us from A Catholic Mom in Hawaii that Blessed Damien of Molokai is moving closer toward canonization. Bishop Silva’s statement is here. It is a question that each of us should be prepared to answer, especially given the frequency of which it is asked. In addition to what I write below, I would very much recommend that you take a look at Pope Benedict XVI's Encyclical Spe salvi, paragraphs 45-48, and this from Catholic Answers. If you don't subscribe to their magazine, The Catholic Answer, you really should. You should also subscribe to This Rock. You might also this article by Paul Thigpen, or this one (for subscribers of The Catholic Answer). Most Catholics grow uncomfortable with this question because they aren’t quite sure what to say, or what the questioner means. It seems to me that many of the people who ask this question understand “salvation” in a different way than does a Catholic. Catholics see salvation as a process while those who ask the question, “Are you saved?” generally see it more as a one-time event. It is almost as though one person sees the question in full color and another sees it in black and white. Those who ask this question seem to believe that once you “accept Jesus as your personal Lord and Savior” (to which I’m always tempted to say sarcastically with a maniacal laugh, “Yes, he’s mine, all mine, and you can’t have him! ), your place in heaven is assured. Such a presumption rightly makes a Catholic uncomfortable – even confused – because it flatly denies the possibility of sinning mortally, of completely breaking the relationship with God through grave sin. For it is impossible to restore again to repentance those who have once been enlightened [Baptized], who have tasted the heavenly gift [Eucharist], and have become partakers of the Holy Spirit [Confirmed], and have tasted the goodness of the word of God and the powers of the age to come, if they then commit apostasy, since they crucify the Son of God on their own account and hold him up to contempt (Hebrews 6:4-6). Clearly, it is not simply about a one-time event. A question very much like this was posed to Saint Joan of Arc during her trial. She was asked, “Are you in a state of grace?” Her reply: “If I am, may God keep me so; I am not, may God make me so” (or something very close to that), a brilliant answer, really, and one that may serve as a model for us here. Whenever I am asked, “Are you saved?” I answer, “I hope so.” This response is usually greeted with a quizzical and unexpected look and the question, “What do you mean?” Well, I say, “Saint Paul says that we should ‘work out your own salvation with fear and trembling’ (Philippians 2:12). That’s what I’m trying to do.” If salvation were simply dependant on a decision we made once in our life, the Apostle would have no reason to write this statement to the Church at Philippi. Naturally, all of this presupposes faith in the Paschal Mystery, without which salvation is unattainable. If this explanation does not satisfy the well-meaning inquirer (the ill-meaning inquirer isn’t worth speaking with because they won’t listen to reason), we can point out further still that salvation is indeed a process by turning to additional writings of Saint Paul and to some of Saint Peter. In this you rejoice, though now for a little while you may have to suffer various trials, so that the genuineness of your faith, more precious than gold which though perishable is tested by fire, may redound to praise and glory at the revelation of Jesus Christ. Without having seen him you love him; though you do not now see him you believe in him and rejoice with unutterable and exalted joy. As the outcome of your faith you obtain the salvation of your souls (I Peter 1:6-9, emphasis mine). A little bit further on, he writes. “Like newborn infants, long for the pure spiritual milk, that by it you may grow up to salvation; for you have tasted the kindness of the Lord” (I Peter 2:2-3, emphasis mine). In the eyes of Saint Peter, salvation is the reward for a persevering faith, a faith that suffers patiently. To the Church in Corinth, the Apostle Paul writes, “For the word of the cross is folly to those who are perishing, but to us who are being saved it is the power of God” (I Corinthians 1:18, emphasis mine). In his second letter to the Corinthians, he says, “For we are the aroma of Christ to God among those who are being saved and among those who are perishing, to one a fragrance from death to death, to the other a fragrance from life to life” (II Corinthians 2:15-16, emphasis mine). Yet again, Paul says that through the Gospel “you are also being saved, if you hold fast to the word I preached to you, unless you believed in vain” (I Corinthians 15:1-2, emphasis mine). What does it profit, my brethren, if a man says he has faith but has not works? Can his faith save him? If a brother or sister is poorly clothed and in lack of daily food, and one of you says to them, “Go in peace, be warmed and filled,” without giving them the things needed for the body, what does it profit? So faith by itself, if it has no works, is dead. But some one will say, “You have faith and I have works.” Show me your faith apart from your works, and I by my works will show you my faith. You believe that God is one; you do well. Even the demons believe – and shudder. Do you want to be shown, you foolish fellow, that faith apart from works is barren? Was not Abraham our father justified by works, when he offered his son Isaac upon the altar? You see that faith was active along with his works, and faith was completed by his works, and the Scripture was fulfilled which says, “Abraham believed God, and it was reckoned to him as righteousness”; and he was called the friend of God. You see that a man is justified by works and not by faith alone (James 2:14-24, emphases mine). This last verse was the reason why Martin Luther sought to remove the Letter of James from the canon of Sacred Scripture; it flatly contradicts his basic premise, but that is another matter for, perhaps, another day. Clearly, then, salvation is not assured by faith alone. Even the Lord himself says, “Not everyone who says to me, ‘Lord, Lord,’ will enter the kingdom of heaven, but only the one who does the will of my Father in heaven” (Matthew 7:21). Salvation, then, is not a one-time event but a process, for “the love of many will grow cold. But the one who perseveres to the end will be saved” (Matthew 24:12-13). We are not certain of our salvation, but we certainly hope for it and pray for it. We who have been redeemed by the blood of Christ strive and pray to remain faithful in order to attain salvation, our faith’s goal. Of course, you can also say, “I have been saved. I am being saved. I will be saved.” That works, too; and it’s perfectly Catholic. ...and it forgot to take me with it! I've been on the telephone this morning trying to track down paperwork for marriage preparation (no easy feat in itself) when I had to leave a voice mail for the secretary to the Vicar General (I never seem to find people in their office, which is just as well since they never seem to find me in mine). "My telephone number is 3...no it isn't. Yes, it is. 3**-**** (giving the correct numbers). Sorry! Thanks!" Today could prove most interesting. Just a few moments ago I received an e-mail from Egeria, the registration "arm" of the World Youth Day 2008 in Sydney, Australia. It's tomorrow there already. That's a strange thing to see. One of the niceties of being in a writing mood is that it also puts me in a reading mood, more so than usual. This has offered the happy chance to catch up on a bit of reading, notably a few journals that have been sitting by patiently for some time. Francis X. Gumerlock has an article in Antiphon 10:2 (2006), the journal of the Society for Catholic Liturgy, entitled, "The Interpretation of Tongues in the Middle Ages." Dr. Gumerlock points out that the Medievals interpreted the gift of tongues as found in I Corinthians 12:10 ("to another is given interpretation of tongues") in a manner very different from that of today. After examining eight commentaries from the Middle Ages, including those of Saint Thomas Aquinas and Peter Lombard, Dr. Gumerlock finds two primary interpretations of this passage, the first being the ability to translate and the second being the ability to teach clearly. These medieval authors do not suggest that possession of the gift necessarily entails the ability to translate ancient or foreign languages by means of a miraculous, pentecostal experience, a supernatural gift of understanding another language without any previous study or natural process of learning. Not that these medieval Christian authors totally discount such a pentecostal phenomenon. They accept, for example, that this was indeed the means by which the apostles received the gift of tongues on the day of Pentecost. They also concede that God continues to display such miracles in special circumstances, such as the experience of outstanding Christian missionaries; for, according to certain hagiographical sources, preaching evangelists like St Dominic Guzman (d. 1221) and St Anthony of Padua (d. 1231) received the gift of tongues in this manner. Nevertheless, by citing Jerome as an example of a person possessing the gift of interpretation of tongues, medieval writers imply that the usual means of coming into possession of the gift is through study or time spent abroad... This more natural process is in keeping with the medieval understanding of the gifts of the Holy Spirit. The supernatural source of the gift is affirmed, but the gift is not given or used in such a way that nature is violated in the process. For medieval believers, then, grace was construed more as divine power that heals, equips, and strengthens, rather than something that supercedes nature (161-162). Remember, grace builds on nature. In the Middle Ages, the gift of interpretation of tongues was a gift of teaching and preaching that functioned in a variety of settings. The most obvious of these settings would have been the liturgies of daily, weekly, and festal Masses and religious services associated with the sacraments. Opportunity for expression of this gift would also have been afforded at gatherings in monastic settings such as chapters, where Scripture was read and explained. The gift might also be put to use in educational settings, during morning lectures and afternoon disputations. Interpretation of tongues would also have been operational in the writing of commentaries and treatises interpreting Scripture, especially the "hard sayings" or more difficult passages of the Bible (163-164). The difference in the interpretation of this passage by the Medievals in comparison to many of the Moderns is quite striking. Some today might criticize the Medievals for not believing in the power of the gifts that the Holy Spirit provides, but Dr. Gumerlock corrects this. "[M]edieval Christians maintained that God was still pouring out the gift of interpretation of tongues," he says, "but they witnessed this gift functioning in their time through translators and biblical expositors" (166). With this in mind I grew curious as to what some of the Church Fathers said about this passage, so I turned to the ever-useful Ancient Christian Commentary on Scripture (New Testament vol. VII) which, sadly, in this case was not very helpful. But this situation is one that Dr. Gumerlock also addresses. Part of the difference of interpretation of this passage then and now he suggests (at least in the English speaking world) is because many of the early commentaries have not yet been translated into English, for which reason we are in great need of the gift of interpretation of tongues. After praying the Regina Ceali yesterday with the pilgrims gathered in St. Peter's Square, Pope Benedict XVI briefly spoke of his recent Apostolic Journey to the United States of America and to the United Nations. I give thanks to God for abundantly blessing this singular missionary experience of mine and deigning to make me an instrument of the hope of Christ for that Church and that country. At the same time I thank God Because I too was confirmed in hope by American Catholics: Indeed, I discovered a tremendous vitality and a decisive will to life and to witness to the faith in Jesus. Now, it could be that His Holiness was referring to the vitality of the faith of the Church in America, but I wonder if it isn't also a hint at the vitality that he clearly experienced during hsi jam-packed visit. Pope Benedict XVI went on to say, "Next Wednesday, during the general audience, I will speak more about this visit of mine to America." I'm very curious to hear the Holy Father's take on his visit. Fr. V. at Adam’s Ale is up and at it already today with a post reflecting on the difference of priestly life. Dr. Peters at In the Light of the Law proposes four canonical ways to handle the situation of the newly elected President of Paraguay, Bishop Fernando Lugo. I’m certainly glad I don’t anything like that to worry about. Nicholas at Phat Catholic Apologetics skillfully answers a rather odd question about the Church and the death of Christ. With the decreasing numbers of people who think logically more questions of this kind will continue to pop up. Jeffrey Tucker at the New Liturgical Movement has a good post on the purpose of Catholic music. Amy at Charlotte was Both offers her “takeaway” from the Papal visit. Rocco at Whispers in the Loggia has a post about Cardinal Egan’s reaction to Rudy Giuliani’s reception of Holy Communion, and Giuliani’s reply that his faith is “a deeply personal matter.” Mr. Giuliani should have listened more closely to the Holy Father’s words: “Any tendency to treat religion as a private matter must be resisted” (Meeting with the Bishops of the United States of America, 16 April 2008). My home parish church, St. John the Baptist, is being sold to a "non-denominational" ecclesial community. Update: Grandview Church - who is buying the properties - have pictures up on their web site. So far, nothing on the parish web site and I've seen nothing in the bulletin. Very sad. It may not be finalized with the Diocese but it sure seems finalized from Grandview's perspective. The view of an empty Catholic church isn't so grand, is it? It was less than three years (?!) ago that I celebrated my first Solemn Mass of Thanksgiving in this church. This congregation, which in fifteen years' time produced three Diocesan priests, one Franciscan priest, and one Trappist monk, is now scattered to the corners of Quincy. Today at Mass I told my parishioners that if they only read three of Pope Benedict XVI's addresses in the US that they should read his address to the Bishops, his address to the ecumenical leaders and his address to the seminarians and young people. These, I think, contain the core of his message. I've been very much in a "writing" mood these past two days and hope to be able to begin dissecting some of the Holy Father's words in the next couple of days. First, a bit of work in the office needs to be attended. Independent and aloof, you don't like to be dependent on anyone. And as for other people, you can take them or leave them. You often don't care. You live your life by your own rules. And you have deep motivations that no one truly understands. Why you would make a great pet: You're not needy or greedy... unlike other four legged friends. I'm a little perplexed by this, though I don't entirely disagree with it. Cats are alright, but I've always preferred dogs. My pastor always liked it when I returned from the seminary for the weekend or for a break because he could count on me to help out and, as he put it, "you entertain yourself." That's true. Capello tip A Catholic Mom in Hawaii. I've just stumbled upon a vestment site I'd not previously seen: Susan Maria Liturgical Studio. The vestments are splendid! Not only is Tuesday, April 29th, the Memorial of Saint Catherine of Sienna, it is also American Life League's sixth annual National Pro-Life T-Shirt Day. What was it that Philip proclaimed to the crowds of Samaria that made them all pay “attention to what was said” (Acts 8:6)? He proclaimed Christ our hope to them, just as Pope Benedict XVI proclaimed to us last week and people all across the world listened to his message. Were you among them? Already here in the Acts of the Apostles we see the differentiation of the three-fold ministry of bishop, priest and deacon established by Christ Jesus. This Philip who preaches to Samaria is not the Apostle, but one of the “seven men of good repute, full of the Spirit and of wisdom” (Acts 6:3). This Philip, together with the other six men, were “set before the apostles, and they prayed and laid hands upon them,” entrusting to them the ministry of preaching and of service to the poor (Acts 6:6). The apostles sent Peter and John to the new believers in Samaria precisely because Philip was a deacon; he was not entrusted with the sacred power to call down the Holy Spirit in the Sacrament of Confirmation. Philip could baptize, but he could not confirm. Peter and John “laid hands upon them and they received the Holy Spirit” (Acts 8:17). In just a few weeks’ time, His Excellency Bishop Lucas will come, as the successor of the Apostles, to call the Holy Spirit down upon some of our young people as he administers the Sacrament of Confirmation. What, then, is the Sacrament of Confirmation? It is more than a mere rite of passage and far more than an individual confirming his or her own faith. In the Sacrament, it is not the one receiving it who does the confirming, but the Bishop, the Successor of the Apostles. He confirms that the faith entrusted to a person in Baptism is the faith of the Apostles living and true and in this way the Sacrament builds up and strengthens the Body of Christ, the Church. Here, then, we come to the command of Saint Peter, the first Pope: “Always be ready to give an explanation to anyone who asks you for a reason for your hope” (I Peter 3:15). Peter’s successor invoked these words on at least three occasions during his visit to us, thereby showing their great importance. When Pope Benedict XVI came to us a few days ago, he came as an apostle, “sent by Jesus Christ,” and “as a friend, a preacher of the Gospel.” He came bringing to us the message of Christian hope and the exhortation to share our hope, our faith, with everyone we meet. He came not only to “strengthen further the bonds of communion that unite us,” but also to spur us on to a deeper faith in Jesus Christ, to live more faithfully as his disciples so that our lives might bear greater witness to Christ our hope. Is it consistent to profess our beliefs in church on Sunday, and then during the week to promote business practices or medical procedures contrary to those beliefs? Is it consistent for practicing Catholics to ignore or exploit the poor and the marginalized, to promote sexual behavior contrary to Catholic moral teaching, or to adopt positions that contradict the right to life of every human being from conception to natural death? Any tendency to treat religion as a private matter must be resisted. Only when their faith permeates every aspect of their lives do Christians become truly open to the transforming power of the Gospel. The Holy Father has challenged us to live our lives in conformity with the truth of the Gospel. Does your faith shape every aspect of your life? How, then, are we to make the changes necessary to live more faithfully as followers of Jesus Christ? We must first of all call upon the Holy Spirit, who will “be with you always, the Spirit of truth, whom the world cannot accept, because it neither sees nor knows him” (John 14:16-17). Secondly, we must heed the words of Saint Peter to always be ready to give a reason for our faith. We do so first of all within the family. And so parents, grandparents and godparents, I ask you: when was the last time you spoke to your children, grandchildren or godchildren about your faith, about the hope that is in you? When was the last time you sincerely sought to understand your faith more clearly in order to explain it more fully and convincingly? This task is given to each and every one of us. Each of us has a solemn duty to grow in the knowledge of the faith, in the knowledge of the truth, and to share this hope with everyone we meet. This is why the Lord has given us the Holy Spirit. At the same time that we seek to grow in faith and in the knowledge of faith, handing it on to each generation, we must also seek to conform our lives ever more closely to this truth, to this faith, to live lives of integrity. In this way we will keep the commands of the Lord and will know his love. His commands are not given as a set of prohibitions to limit our freedom. Rather, they open us up and show us and guide us along the path of true freedom, along the path of life! What do you seek in life? Do you seek happiness? Contentment? Peace? Of course you do. Have you found it yet? I tell you, you will never find it apart from Jesus Christ! He says to us today, “Whoever has my commandments and observes them is the one who loves me. And whoever loves me will be loved by my Father, and I will love him and reveal myself to him” (John 14:21). Today, my friends, call upon the Holy Spirit to help you follow the command of Christ to love God and neighbor. By faithfully following him you will find life, joy and peace and in this way you will be filled with hope, the hope that makes all things new in Christ. Amen! Pope Benedict XVI, Video Message to Catholics and People of the United States of America on the Occasion of the Upcoming Apostolic Journey (8 April 2008) and Address at the Welcome Ceremony (16 April 2008). Ibid., Meeting with the Bishops of the United States of America, 16 April 2008. In today's issue of the Catholic Times are several articles of interest relating to late week's Apostolic Visit of Pope Benedict XVI. First, Bishop Lucas offers his comments on the importance of the Papal visit in his weekly column. Second, my reflection on going to Washington, D.C. and New York that the Editor has appropriately titled, "Pope Provides Model of Reverence, Spirituality for Priests." Third, a photo essay of sorts taken by various people from the Diocese at different Papal events. Over the past several weeks I have noticed a growing dislike of being in my office in the parish center. For some time I wasn't quite sure why, but as time went by - and especially since my return from my pilgrimage - I discovered the reason behind tbe discomfort of being in my office: it's too small, and I grew tired of facing a wall. Months ago I positioned my desk toward the wall so as to free up space in the center of my office so that couples might sit next to each other for wedding preparations. That simply won't work any longer. So today, before the weather changes and my joints don't want to do anything, I've set to rearranging my office, no small feat in itself. I'm not sure what the final outcome will be, but I'll keep you posted. There's an interesting - and very sad - story in Poland that apparently has parallels in the U.S., though I've not heard it yet. Apparently some priests and Protestant ministers are being accused of plagiarism in the pulpit by "lifting" homilies and sermons that others have first preached. The problem seems severe enough (?) that the Polish Bishops published a book, To Plagiarize or Not to Plagiarize, that seeks to show priests how to draw inspiration from other sermons without copying them word for word. This entire "situation" is sheer nonsense! Why did Saint Augustine of Hippo first record his sermons and disseminate them to his priests? Precisely so they would have something worthwhile to say while they preached! Why did Saint Anthony of Padua write his sermons down? So they could be shared with other priests and used as a preaching tool (you could never simply preach his sermons as he really only gives strong outlines, and prayers). Let's be honest. We know that the meaning of any one text of the Sacred Scriptures can never be exhausted, but because of that very same fact no one preacher can ever see the Scriptures from every angle. We need the help of others to help us see things more fully, more clearly, more profoundly. And sometimes it just so happens that another person can say something far better than I and so I use their words. Now, in the text of my homilies, you'll notice that when I can I always give the appropriate references in a footnote (sometimes a quote comes to mind but I can't quite remember from whence it came), more for my future benefit than for any other reason (you never know when I might want that quote again). When I preach the homilies I almost never make reference to the fact that what I am about to say is not my own. Why? Because the eyes of half of my congregation glaze over at the words, "So-and-so said..." (in whatever form I say them). I'm not sure why, but when I start to quote from someone - anyone - a great number of people stop listening. When I, on the other hand, hear a preacher quote from another person I listen all the more intently, especially if the quoted person is a Saint or a Pope, because then it is clear that the priest has prepared his words and that his thoughts are not simply his own. We have been given a Sacred Tradition and it is always comforting to me to fall back upon the faith of those who have gone before us, to learn from them and to hear their wisdom. Let's be honest on another level: some priests and deacons simply are bad homilists. Why should they not use the words of another to rouse the people to faith? Simply because the words are not his own in no way implies that he does not believe them, that they do not convey the conviction of his heart. It would seem to show rather the opposite, that he cares so deeply that he wants to deliver a word to fan the flame of faith. N.B. : If any priest or deacon wishes to use my homilies in full or in part, you have my permission to do so. They certainly aren't to the quality of St. Augustine or St. Anthony, but they may be helpful. That is why I post them. If others who post their homilies or sermons on-line don't want others to use them, perhaps they shouldn't post them in the first place. About what do you speak most? t doThis evening I attended a gathering of Quincy University alumni which was very enjoyable. It was a good opportunity to see a few parishioners who are alumni, as well as people newly associated with the University. I owe much of my intellectual and spiritual formation to the Franciscan Friars who were present during my studies there. Through my study of history I was taught to think critically and analytically, and through my study of philosophy and theology I was very well prepared to enter the seminary. For all that Quincy University has done for me, I shall be ever grateful and I shall seek to repay it in time. Who knows? Perhaps, God willing, I shall one day there (that is one of my dreams [I seem to have a lot of those, but if you’re going to dream you might as well dream big]). But this isn’t the point of this post. After the “official” portion of the evening concluded I found myself engaged in conversation with several people about Pope Benedict XVI and my take of him. Frequent readers of this blog – and hearers of my homilies – will of course know of my deep and profound love of the Holy Father, not only of the office but especially of this particular man who is Pope. There are some who perhaps devoted to Pope Blessed John XVIII or the Servant of God Pope John Paul II. While I respect each of these greatly, I am devoted to Pope Benedict XVI, whom I am confident will one day be numbered among the Saints of God. I’ve tried before to describe the reasons why I have such deep affection for Pope Benedict. I’m not sure that I can even describe what this affection toward the Holy Father is, let alone the reasons for it, but I shall try (without, of course, trying to elevate myself to his stature). When I see Pope Benedict XVI I see a man very much like myself. I think it fair to say that the affection I feel toward the Holy Father is the love of a son. He is a man quite at home amongst his books and amongst a few close friends. He is a retiring man who prefers to work “behind the scenes.” He is quiet, humble and sincere. He is a man who knows the greatness of the task set before him and his own unworthiness of it. He is a devoted teacher who sets out to demonstrate not his own ideas or innovations but the truth, nothing more and nothing less. He is a man who knows himself and who will not be swayed with the blowing of a new wind. He is a man who doesn’t smile a great deal, but when he does it is genuine and lights the room. With Pope Benedict, what you see is what you get. There is no pretense, no arrogance. He is a simple man who has accepted the will of the Lord for his life, a man who has resigned himself to the fact that he cannot return to his home. As I’ve said before, at the heart of Pope Benedict XVI lies the heart of a poet, a poet who loves Christ Jesus above all else and has devoted his life and service to him. These are only some of the reasons why I have such a deep affection for this man. When I see Pope Benedict XVI I really do see a father. I see a man very much like myself and with whom I can relate. Everything that I have heard him say and that he has written (that I have read) I agree with completely (something I’m not sure I can say about another author). Everything he says resonates within me. There is something about Pope Benedict that reaches straight to my heart, calling me to imitate him as he imitates Christ. The only other person to whom I feel such a bond of the spirit is St. Francis of Assisi. I simply am drawn to him and through him I am encounter Jesus Christ. Joey of Catholic Home Schooled Teens offers a little review of Ben Stein’s new movie/documentary, Expelled: No Intelligence Allowed. I hope to see it in the next few days. Hallowed Ground has a post compiling some of the words of the Church Fathers on the Real Presence, together with his usual photo collection. Fr. Z. tips us off that those church signs are talking in Kansas City again, this time about the Holy Father’s Apostolic Visit to the U.S.A. and to the U.N.
Have you ever wanted to pray grace before meals in Latin, and in chant, no less? If so, the New Liturgical Movement can help. The Diocese has released a video message for the Built on Faith, Renewed in Hope campaign to restore the Cathedral of the Immaculate Conception. Do have a look. There is also a brochure for the campaign. I've made my pledge. Will you make yours? In the next few days I'll answer some commonly asked questions about why you shoudl consider giving to this campgain. The interview with the reporter went very well this morning. He was very kind and knowledgeable, both about Pope Benedict XVI and about previous Papal visits. It didn't hurt that he is Catholic himself. The article will be in Sunday's edition of the Journal Gazette and the Times-Courier. These papers also ran a story about a few of their locals who attended some of the Papal events. I like these papers already. This morning I received a telephone call from a reporter from a newspaper in a city about half an hour north of Effingham. Word of my pilgrimage to Washington and New York reached him and he also found my blog, which intrigued him. He asked if he could have an interview with me, which I am happy to give. I thought he would want to conduct it over the telephone but he wants to meet with me personally. I must say that I'm rather happy about this. He'll arrive in the morning and will interview me after the morning Mass. He'll certainly ask about the pilgrimage and the blog, and I'll try to throw something in about World Youth Day 2008. The parish and I may not have a good relationship with our own local newspaper, but it seems we may with other papers. Curious. One of my students has asked me to publicize his new blog: Argyle socs n' mocs. Despite the title, it's an interesting blog. Do take a look. He's a very talented young man in many ways and I'm curious to see where this blog will go. It has a promising future, I think. I've posted pictures I took in Washington, D.C. on my last day in the city and pictures from the ferry tour of the New York harbor area and Times Square. I've also posted the pictures I took at the Mass at Yankee Stadium before my battery died. Pictures from the Mass at Yankee Stadium are up here and here. These pictures were taken on a friend's camera because my battery died. I did manage to take a few on my camera and I'll post those in the morning. After a long bus ride from New York to Indianapolis, I arrived safely in Effingham this morning about 9:30 and entered quickly - though a bit unwilingly - back into reality. I met with a couple preparing for marriage after lunch and went with our WYSE team to be recognized by the County Board for taking third place in the State competion (one of our students took first place in math!). I walked there and back from the parish - and to the high school - and bumped into a few parishioners along the way and some other people whom I know through various means. After dinner I went to the Board of Education meeting, which lasted two and a half hours. Life back in the parish isn't quite as exciting as what commenter CAH has termed Benedictapalooza 2008. I hope there will be another one in 2009! During the drive back to Effingham it occured to me that in just over three months time I've seen Pope Benedict XVI six times! And now that I'm back in reality I do miss seeing the Holy Father seemingly everywhere I went. I'm off to bed soon - after I upload a few pictures - and in the morning the Pastor wants me to take his bulletin column this weekend giving some thoughts about my little pilgrimage out east. This morning I submitted an article for our Diocesan paper. Once both have been published, I'll post the texts on the blog for you. I arrived safely in New York City and met up with a group from my Diocese for a boat tour of the area. We're at the hotel now and will leave in the morning for Mass at Yankee Stadium. Why do the people stand up and applaud all the more after the Holy Father motions for them to be quiet? There enthusiasm, though, is wonderful! I probably wouldn't have stopped, either. I've only met a handful of deacons who know well their role within the Liturgy, especially when it comes to incense. It appears the Holy Father does not have such a deacon with him this morning. Here is my post on the election of Pope Benedict XVI three years ago today. O God, Shepherd and Ruler all Thy faithful people, look mercifully upon Thy servant Benedict, whom Thou hast chosen as shepherd to preside over Thy Church. Grant him, we beseech Thee, that by his word and example, he may edify those over whom he hath charge, so that together with the flock committed to him, may he attain everlasting life. Through Christ our Lord. The people were amazingly quiet while the Holy Father knelt in prayer. If only churches everywhere were that quiet when people were trying to pray. Finally! A Bishop is greeted properly as he enters a church! The Holy Father was just presented with a crucifix to kiss upon entering St. Patrick's and was given the aspergilium to sprinkle the people with Holy Water. When I arrived this morning at the Metro station at 6:45 it was very obvious that the station was not yet open. Given that my train for New York was at 7:30, this did not bode well. Hence, I missed my train and will catch the next one that leaves at 10:20. It's very frustrating! There were no signs anywhere indicating that that Metro station would not open until 7:00. This caught quite a few of us by surprise this morning. As I sit and wait I'll watch the Holy Father celebrate Mass in St. Patrick's Cathedral. As I've been packing my things to travel to New York in the morning I've been watching the welcoming ceremonies at the White House (which I've not yet seen). Let me simply say that my respect for President Bush has increased considerably. Well done, Mr. President! Labels: Benedict XVI, George W. Bush, Papal Travels, Washington D.C.
What follows are some general observations and thoughts of two capitol cities, Rome and Washington, D.C. Both cities have a metro system and each system has its own unique advantages. A weekly pass can be purchased for the Roman metro for almost nothing; the Washingtonian system has no such pass making metro travel more expensive. The Roman system has a linear map of the metro line you are riding inside each car, making it very easy to see where you are going (or should have gotten off). The Washingtonian system has pillars on the platforms listing the stops to which you are going, but not where the train has been, making navigation a bit tricky sometimes (system-wide maps are in each car, if you can get to through past the passengers). Roman "fast food" staff will chat with you before, during and after you place your order; Washingtonian fast food staff will talk on their phones while you place your order, and may or may get your order right. The government buildings in each capitol have similar architectural aspects. Both cities have cobblestones, though Washington, D.C. has far fewer than Rome. Both cities are filled with people, both residents and tourists. It feels safe walking through the streets of Rome late at night, even in alleyways; not so much in Washington, D.C. This evening I went to the National Mall to wander around a bit before I leave for New York City early in the morning. Walking out of the Federal Triangle Metro stop the architecture of the buildings reminded me of Rome, as did the cobblestones I saw. The height of the federal buildings, too, reminded me of Rome. As I approached the National Mall and saw the Washington Monument with the joggers going around and the tourists wandering a bit I thought of only one thing: the Circus Maximus. What made matters worse was one particular sign on a bus stop. It had a picture straight out of a gelatria (an Italian shop with the finest ice cream type dessert (only far superior). I became very excited and looked more closely to see where the shop was located and I began to taste again the flavors of gelato and I could feel the texture of it in my mouth; I could even smell it! It turns out the sign wasn't for gelato at all, but for a foreign exchange program through a university, thus shattering my dreams in an instant. Oh, Eternal City! When shall I return to thee? I'm not sure the ecumenical leaders were sure how to take the Holy Father's remarks. Their applause seemed slow and not so enthusiastic. He has given a strong challenge against subjective feelings in the choice of religion. He has reminded us that we cannot chose our faith, religion or denomination on what I like. We must rather conform ourselves to the truth. Just because I don't like what this church does or what this pastor does is not a reason to join another ecclesial community, let alone begin a new one. Our good friends at EWTN have posted the words of the Holy Father at the ecumenical gathering and at the synagogoue. Esther, that Catholic Mom in Hawaii, passes on a petition to fire Bill Maher for remarks he made against Pope Benedict XVI. Fr. V. at Adam’s Ale has a most excellent post on participation in the Mass, borrowing from Pope Benedict XVI. Do stop in at the Shrine of the Holy Whapping for some hilarious photo captions of the Holy Father’s U.S. visit. You’ll have to scroll down a bit but they’re well worth it! Fr. Longenecker offers a number of excellent reasons why he’s Catholic. The Curt Jester reviewed the biography of Pope Benedict XVI that I mentioned the other day, Benedict of Bavaria. Pope Benedict XVI's words to the ecumenical gathering are very courageous and spot on! Well done, Your Holiness! I'm delighted to say that Hallowed Ground and I have both won the 2008 Carolina Cannonball Award in the category of "Best Under Appreciated Catholic Blog." Many thanks to those of you who cast your vote for me! The other winners of the 2008 Carolina Cannonball Awards are listed here, together with the runners up. Apparently I've missed a bit of an earthquake back in Effingham during my time away. I just noticed that the speeches, addresses and homilies of the Holy Father delivered thus far in the United States are up on the Vatican web site. The speech at the United Nations is not yet up. Labels: Benedict XVI, New York, Papal Travels, Washington D.C.
After the two introductions and welcomes to the Holy Father, Pope Benedict XVI received a thundrous applause. And...it seems I was right about speaking in French. There is some question on EWTN now as to what language the Holy Father will speak when he addresses the United Nations in a few minutes. It might well be remembered that when he visited Turkey, the representative of Turkey addressed him in English and Pope Benedict XVI addressed him in French because, as he said, his remarks were prepared in French, the official diplomatic language since 1066 when William of Normandy conquered England, and not in English. I shouldn't be at all surprised if today the Holy Father speaks in French. But I also wouldn't be surprised if he speaks in English. Meetings with victims of sexual abuse. Address to the Jewish community. Labels: Benedict XVI, Nationals Stadium, Papal Travels, Pope John Paull II Cultural Center, Washington D.C.
Pictures taken before the Mass are here. Pictures taken during and after the Mass are here. Labels: Benedict XVI, Nationals Stadium, Papal Travels, Pictures, Washington D.C.
Labels: Benedict XVI, Papal Travels, Pope John Paull II Cultural Center, Washington D.C.
What is a "bilateral dialogue"? Doesn't every dialogue involve two parties? The Holy Father currently looks as though he's looking for somebody to tell him what to do next. That's part of why I love him; his expressions say everything. I guess it's what happens when he arrives early. Update 2: Pictures have been posted to Blogger and inserted below. Update: For some reason, I can' t seem to upload photos to Blogger at the moment. When I can, they will be uploaded. For the third day since I've been in Washington, D.C., the sun shone brightly and there was not a cloud in the sky, but we sure could have used one! Sitting on the ball field in the open sun for four hours gets a bit warm, even with sunblock. I left the monastery this morning at 6:30 with three Franciscans (two priests and one brother) and three Diocesan priests from various Dioceses who are studying here in the Capitol. Another friar drove us to a Metro stop where we didn't expect to find a crowd of great size, and I'm glad we did! The train certainly was filled with people, nearly all of whom were going to Mass at Nationals Park. When we exited the train at Navy Station, I think one person stayed on the train. One of the friars joked with her that now she could stretch out and have the whole train to herself. As it did yesterday at the White House, the crowd of pilgrims moved along fairly swifly and calmly. Numerous police officers were on hand to direct traffic and help the throngs of people cross the street in orderly fashion, while still allowing vehicular traffic to continue. Upon reaching the stadium, we priests were directed around to the back side where the press core also entered. After passing through the security check point we went to the President's Club to vest. On the way there we had to walk through a very long hallway filled with Bishops and Knights of Columbus. I saw my Bishop, the Most Reverend George J. Lucas as well as Bishop Kevin Vann, a priest of the Diocese of Springfield in Illinois. Bishop Vann joked with me, "Why am I not surprised [that you're here]?" I looked for Bishop Larry Silva but didn't find him on my way to the vesting area. I would wager that outside of a Papal event the President's Club is a very nice room, but when it's packed with priests and deacons it's rather chaotic! Somehow while in the room I lost the friars that I was with; we already lost the other Diocesan priests in the staidum on the way to the President's Club. So I went back through the Episcopal hallway on the way to the field and took a picture with Bishop Lucas. When I arrived on the field I wandered about looking for priests that I knew, but there were a great many priests all of whom were either wandering about themselves or chatting in small circles. I couldn't find anyone I knew so I went looking for a place to sit. 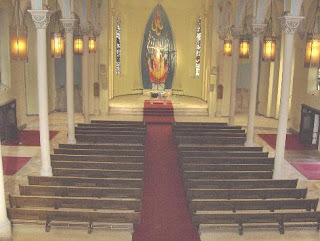 I found one with a good view of the Papal chair, though from it you could't see the altar becuase of the posts of the "stage" upon which the altar was placed. About twenty minutes later, a priest of the Diocese of Joliet, who was a couple of years ahead of me in the seminary, came over to say hello and together we realized that the sit I had chosen was part of a bank reserved for priests of the Archdiocese of Washington. Together, then, we went off looking for new seats and chose a few (a couple of other priests were going to join us) in the very last row for concelebrants at the back of the field because I knew that the Holy Father would take a quick tour of the field in the "Popemobile" before Mass. The Holy Father is currently at the Catholic University of America, so I'll post more later. Labels: Benedict XVI, Nationals Stadium, Papal Travels, Washington D.C. The Pontiff takes those steps better than I do! Labels: Benedict XVI, National Shrine, Papal Travels, Washington D.C.
As the Holy Father leaves the Basilica I hear a helicopter flying overhead. I'm only about a 20 minute walk away. $870,000 from the faithful of hte United States to be used for the Holy Father's charitable activities. I may be visiting with a priest from the Diocese this evening so I'm not sure if I'll be able to examine and respond to his words tonight. If not, I'll try to do so tomorrow afternoon or evening. Rocco has posted the text of the Holy Father's address to the United States Conference of Catholic Bishops this evening. As he answers the firs to the questions posed to him by the Bishops, the Holy Father is relaxing considerably, using facial expressions and gestures, leaning back more comfortably in his chair, and speaking more spontaneously. In is his element! His Emminence Cardinal O'Malley is taking notes of the Holy Father's address. Good for him! Labels: Benedict XVI, Cardinal O'Malley, National Shrine, Papal Travels, Washington D.C.
...to Pope Benedict XVI has been posted. I think His Emminence summed things up very nicely, as indeed he always does. Labels: Benedict XVI, Cardinal George, National Shrine, Papal Travels, Washington D.C.
Can everyone find their Bishop? I haven't seen mine yet, but I'm sure he's there. I'm glad to see that the Holy Father's stole is not at an even length on both sides under his cope. For reasons I can't figure out, underneath a cope the stole never seems to stay in place. And fixing it in the middle of a Liturgy looks distasteful. Do other priests have this problem? Happy birthday, Most Holy Father! With all due respect, the Bishops should have practiced the responses. And shouldn't sing so loudly as individuals. But that organist is fantastic! That cope is splendid! Raymond Arroyo of EWTN tells us it ws the one used 90 years ago at the dedication of the Shrine. We've seen the mitre before in Rome, and the staff, too, of course. That seems like a rather large Papal entourage of Bishops and Monsignori following Pope Benedict XVI just to move from one chapel to another. Labels: Benedict XVI, Papal Travels, Washington D.C.
Why is it that almost nobody knows how to start singing "Happy birthday" on the right note? Labels: Benedict XVI, Pastoral Visit, Washington D.C.
Msgr. Rossi is not as gentle at directing the Holy Father as is Msgr. Ganswein. The Papal Secretary should take over. Anyone who still believes the old lies about "God's rotweiler" or the "Panzer Cardinal" only needs to look at Pope Benedict's smile to see the truth of the man. Just before entering the Shrine, Msgr. Georg Ganswein motioned for the Holy Father to wave again to the crowds. No sign of his age! Greeting the crowds Pope Benedict seems as young as ever! As he waved to the crowds outside the National Shrine, Pope Benedict XVI tried to stand up to wave better, but the Popemobile must have been moving too quickly as he sat right back down. Pictures of today's adventures are available here. I have decided to stay at the monastery and watch Pope Benedict XVI's arrival at the National Shrine of the Immaculate Conception on EWTN. My feet need some rest before the festivities tomorrow. Judging by the size of the crowds gathered on the streets outside the Shrine, I'm glad I didn't head down! That crowd looks more congested than the one on Pennsylvania Avenue. I haven't yet had a chance to read what the Holy Father said at the White House this morning, but you can read them here. After the private meeting of the Holy Father and the President, this communique was released. Pictures from the day's events can be found here. This morning I set out for the south lawn of the White House in hopes to help greet the Holy Father upon his arrival at the residence of the President and First Lady, and to wish him a happy and blessed 81st birthday. Upon arriving at the White House I saw a very large line of people moving rather quickly, quietly and calming toward the south lawn, still about two blocks away. It became very clear that this was the way to go, but it also appeared that most of those in the line were holding tickets. I asked one of the police officers standing nearby – all of whom I encountered were very pleasant and happy – and she told me that I did, indeed, need a ticket for the greeting and welcome ceremonies. I expected this might be the case when I left the monastery, but I left nonetheless. I almost headed back to the monastery for a couple of hours, thinking I would head out later to greet the Pope Benedict XVI along the road to the Apostolic Nunciature (I’ve been there one. The building is grand the Nuncio very pleasant and friendly). But then the thought occurred to me that, since I was already so close to where the “Popemobile” route would begin, that I should walk around to the other side of the White House and take a look at how crowded Pennsylvania Avenue already was. It didn’t look too bad so I decided to head up Pennsylvania Avenue to find a spot to greet the Pontiff. The sidewalks between 17th and 19th streets were filled with Hispanic pilgrims, most of whom seemed to be associated in some way with the Neocatechumenal Way. After 9th Street the sidewalks emptied considerably, almost entirely, really, so I decided that was the place to park myself. I stopped at a Starbucks – there wasn’t much in the that area that I could see – for some baked goods and plopped myself down along Pennsylvania Avenue between 19th and 20th Streets, directly across from the Mexican Embassy. This was about 9:10 a.m. and the Holy Father would not be passing by for another three hours. At 9:26 a.m. this part of Pennsylvania Avenue began to start filling up and the energy of the crowd closer to the White House was clearly heard. The one song – and I mean one and only song – sung throughout the morning was something like, “Alleluia, alleluia, alleluia, resucito,” repeated ad nauseum. If I never hear that song again I will be quite happy. Three hours of it is simply too much! At 9:40 a.m., after being swarmed and surrounded by a group of Hispanics from the Neocatechumenal Way, who very rudely planted their unusually large banner without poles to elevate it, directly in front of me, entirely blocking my field of vision for – quite honestly – five feet on either side of me. I decided to get away from them and moved up Pennsylvania Avenue toward 20th Street where it was still calm and where only a few caucasians were settled. Much to my surprise, this was the only part of the day in which I experienced any part of the rudeness of a crowd. I certainly don’t mean this to sound racist; it was precisely what happened. There was a stark contrast between the small area not resounding with Spanish music. It was much quieter, calmer, and peaceful. Even the police noticed this and about the time I moved up, so did many of them. As time went on more and more people gathered on the side of the street opposite me – the side with the Starbucks – but on my side it remained rather quiet and empty, which pleased me. About an hour after I moved further up, two local ladies also moved up seeking a quieter and more peaceful vantage point. We chatted for a little while and I then I went back to reading Benedict of Bavaria (I’ve only read the Introduction and the first chapter as yet, but I can already tell this will be an excellent biography of the Holy Father). About 10:30 a.m. or so, a delightful woman who works for the Red Cross joined me on the sidewalk and we spent the next hour and a half chatting away. To my surprise, the three hours of waiting for the Holy Father passed rather quickly, without any real opportunity for boredom. There was plenty to do: talk with people around you, listen to repetitive singing, watch the sidewalks fill up and the police move around, listen to those selling their wares waiting for a good bargain and, where I was at least, talk with the police. The officers near my little place on the sidewalk were wonderful! At one point they even led the sidewalks in “the wave” trying to get a little friendly competition going between each side of the street. After the Pope went by and the crowd began to disperse, one of the officers who has been on the force for twenty years asked why all of the crowds couldn’t be like this one. He said that we were, far and away, the best crowd he’s ever been with. This same officer introduced me to the Chaplain of the Washington Police Force, a Monsignor whose name I can’t recall. The officer told me that when the chaplain was named a Cardinal I could come and become the chaplain. The story must have gone around because the Monsignor came over on his motorcycle and told me to forget about it; he loves his ministry and has no intention of giving it up. I'm very grateful for the good work of the police force. Thank you!Along Pennsylvania Avenue, I’m not sure if much work was accomplished today, despite the great many people in the office buildings. Many of the workers were up on the roofs, on the balconies, and at the windows of their offices. I’m sure there are other things I could pass on to you but I can’t think of what they are at the moment. All in all, the whole experience on the sidewalk was a joy, and really seemed like something out of a movie. When the Holy Father finally passed us, the crowd erupted in cheers and the great joy and happiness of everyone present was very obvious. As the Popemobile rolled along, Pope Benedict XVI leaned from one side to the other so that he could greet the pilgrims on either side of the road. Sometimes I wondered if he wouldn’t lean right out! Afterwards I decided to try to hop my way via the Metro closer to the Nunciature to see the Holy Father again. I wasn't successful, but on the way I met two very nice photography students who were hoping to do the same. More pictures will soon be available. Labels: Benedict XVI, Papal Travels, Pictures, Washington D.C. It's been a full day! After standing and walking on concrete sidewalks for the better part of the last six hours, my feet are killing me! I'm still debating about heading down to the Catholic University of America in a short bit to catch the Holy Father again. More pictures will be added soon, as will a post about my day. It's a chilly morning here in the Capitol (44 degrees), though the sun is brightly shining (and is expected to shine brightly throughout the Holy Father's stay in the city) and should warm us up to a very pleasant 70 degrees or so. I've decided to head off to the White House and hope for the best. If things there don't work out I can always play around for a bit before heading off for the spot I've chosen to view the Popemobile route. I'm taking my backpack with me, complete with a magazine and a book, a bottle of water and one of DrPepper (naturally!) SweetTarts, peanut butter crackers, cell phone, camera, Nintendo DS and a change of clothes because wandering around in the sun for several hours in black tends to be a bit warm. I thought about bringing my laptop, too, for live posting but I've pretty well decided that would be too bulky (but I may yet change my mind). 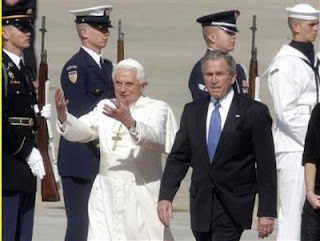 Pope Benedict XVI gives President Bush a tour of Andrews Airforce Base? John Allen has quickly transcribed the questions reporters asked Pope Benedict XVI on board Shepherd One and the Holy Father's responses. Newsweek has an interesting piece on the so-called Popemobile (what else would you call it?). Ignatius Press is offering 20% off of select books by Pope Benedict XVI through April 22nd. There's not much else to pass along right now. His arrival was very quiet and without much fanfare, so to speak. Tomorrow should be a different matter all together. Ordinarily I quite dislike crowds, and that's putting it mildly. At least I don't like crowds in the U.S.; in Rome they don't seem to bother me so much, but they're also easier to navigate through. I don't know why. The greater the number of people in one place the greater the level of complete disregard for the other person. Experience has proven this time and time again. Ever been at the store very clearly looking at an item on the shelf in front of you (with space between you and the item so you can actually see it and the other brands) only to have someone park their cart directly between you and the item you're looking at, with no word of apology or excuse? I can't stand that (and that's putting that mildly, too). I know that tomorrow will not be much different than any other day in this regard. People are human and humans are sinful and, as much as I wish they would and know they are capable, a great many people today simply do not think (at least about much other than themselves). A lot of the world's frustrations could be solved if people would just think a little bit more. (All this being said, if you read my blog and happen to recognize me in the next few days, do come and say, "Hello." And a bit more if you like). Am I pessimist? No. An optimist? Not really. A realist? I think so. Is the glass half-full or half-empty? Half-empty, that it might be filled again. I know the crowds tomorrow will drive me crazy and irritate me greatly, but strangely enough I'm rather excited about the prospect of sitting outside on the sidewalk for four hours waiting to watch the Supreme Pontiff roll by. So far as I can tell, I have two major decisions to make tomorrow? First, do I head to the White House to see the Pope and the President on the south lawn? Two, which street and which sidewalk do I park myself on for the Popemobile route? If you're in the area or in the "know" and have any suggestions or thoughts on these two matters, I'd be very happy to hear your thoughts. The Pontiff himself looks well rested, but the wind has done a number on his cassock! That happens to mine sometimes! I hope the Holy Father was able to sleep a bit during his flight across the Atlantic. Those trans-Atlantic flights certainly can be draining. 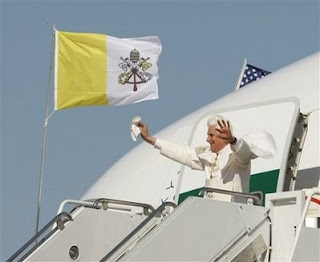 It's taking a while for Pope Benedict XVI to disembark. I wonder if he's waiting for the reporters to collect their bags to clear the aisle? 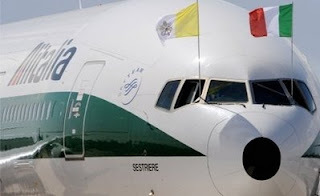 When Pope Benedict XVI boarded Shepherd One, the Vatican flag and the Italian flag were on the nose of the plane. Upon landing on the ground in the U.S., the Italian flag has been replaced by the American flag. 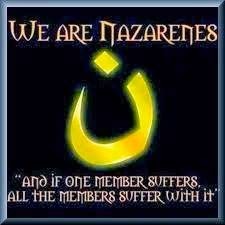 Not only that, but the Vatican flag switched sides! I wonder how they did that? Fr. V. at Adam’s Ale passes along the wisdom that if you are a high school boy – or, presumably, a young man in college – and your guidance counselor and tests of various sorts suggest that you become a cruise line director, you’re really called to be a priest. Rorate Caeli has a post with some of what the Holy Father Benedict XVI has said in the past about the United States of America, with links to the full texts. Fr. Longenecker has an excellent post on heresy, apostasy and schism. He also has a fine reflection on shame. The Pontiff is scheduled to arrive in about 40 minutes time. EWTN begins a live broadcast at 3:30 p.m. (Eastern). I'm off to find a television. I saw this over at Mulier Fortis. You can view the pictures I took this morning at the Nation Shrine of the Immaculate Conception here and here. If the links don't work, let me know and I'll place the pictures elsewhere. Labels: National Shrine, Papal Travels, Pictures, Washington D.C. I saw three nuns doing the same as I in the photo below and decided to follow their good example: Is it tacky? Yes. Is it dorky? Yes. Is it fun? You bet! The cardboard stand up is outside the bookstore of the National Shrine of the Immaculate Conception, which, incidentally, has an excellent selection of books. The chair for the Holy Father and his Deacons and the stools for the Masters of Ceremonies are in place in the Crypt Church of the National Shrine of the Immaculate Conception are in place. The Holy Father Benedict XVI will pray Vespers and meet with the United States Conference of Catholic Bishops in the crypt church Wednesday at 5:30 p.m.
All things considered, the chair isn't too bad. Certainly it could be more grand, but it could also be much worse. I like the contrast between the white fabric and the dark wood. The darker wood also seems to fit better with the crypt chapel than a lighter wood. This morning I went to the National Basilica of the Immaculate Conception and overheard some of the bookstore staff saying that the Basilica will be closed to the public tomorrow (Wednesday). I didn't think to ask whether it would be closed on Thursday when he meets with Catholic educators at the Catholic University of America. I also went to the Pope John Paul II Cultural Center, only to find it closed, and apparently so since the weekend. I doubt it will be open until Friday; I could not get inside to ask anyone and I can't remember what the sign on the door said. The American Papist provides us with a couple of links to articles concerning a press conference of sorts that the Holy Father held aboard Shepherd One. The Holy Father should land on U.S. soil in about 3 hours and 45 minutes. The USCCB has updated the Popemobile routes with times that the Holy Father can be seen at various points along the way. I'll be reading through the instruction book for my camera to sure I know how use that handy "burst" mode. Pictures from this morning will be on the way soon. I arrived in the nation's capitol about two hours ago after an uneventful drive and flight (which is most always a good thing). After meeting up with a classmate of mine who is studying in Wasingtion, D.C. I was shown to my room and given a brief tour of the monastery where I am staying. After grabbing a quick bite to eat we took a brief drive through the Catholic University of America where there is an impressive line up of media vehicles (pictures of which I will post tomorrow). I'm off now to bed and when I awake I'll begin plotting out the week's activities. I've been rather quiet the last two days, in no small part due to a bout with what I think was food poisoning or what others think was a one-day flu or some such thing that left me feeling quite horrible all day yesterday. Due to having no food in me I was unable to take my arthritis medicine and, with the disgusting wintry weather we had yesterday, I barely had any strength and only survived two Masses by the grace of God. I was able to have a bit of jello for lunch and a bowl of dry cherrios (honey-nut) for supper and slept well throughout the night. I am delighted to say that I feel temendously better today and am able to eat, though I don't especially feel like eating. In just a few minutes I am off to Champaign, IL to have lunch with our Worldwide Youth in Science and Engineering team from the high school who compete today in the State competition. From there I will drive to Indianapolis to fly to Washington, D.C. and should arrive at my lodging before 10:00 p.m. If I get a chance in the airport I will post a bit more and of course I will post throughout the week. Please keep me in your prayers and I will keep you in mine. Today is traditionally known as “Good Shepherd Sunday,” a very fitting title for what will occur in just a couple of days. 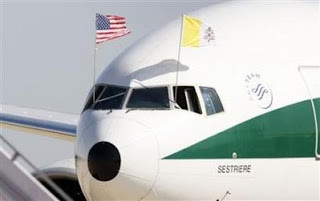 On Tuesday Shepherd One will land in Washington, D.C. and His Holiness Pope Benedict XVI will begin his five-day visit to these United States of America. Is to reach out spiritually to all Catholics in the United States. At the same time, I earnestly hope that my presence among you will be seen as a fraternal gesture towards every ecclesial community, and a sign of friendship for members of other religious traditions and all men and women of good will. I am very much looking forward to being with you. I want you to know that, even if my itinerary is short, with just a few engagements, my heart is close to all of you, especially to the sick, the weak, and the lonely. It is comforting to know that His Holiness remembers us in his prayers. We ought to remember him in ours. We know that as the Vicar of Christ, the Pope, the Successor of Saint Peter, speaks on behalf of Jesus Christ. When we hear the voice of the Pope, the Bishop of Rome, we hear the voice of Jesus Christ because the Pope shepherds the universal Church in the name of Jesus Christ. When the Holy Father comes to us, he, together with the Bishops, will speak to us all. It will be as though the first reading occurs again: “Then Peter stood up with the Eleven, raised his voice and proclaimed” (Acts 2:14). 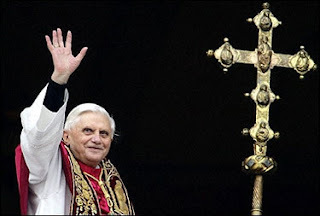 Pope Benedict XVI will stand with the Bishops and proclaim “Christ our hope” (I Timothy 1:1). If we listen to what he will say to us, what happened to those who listened to Saint Peter will happen to us: we will be “cut to the heart” (Acts 2:37). We will be cut to the heart because we will “recognize his voice” (John 10:4). We will recognize his voice because he, too, is the good shepherd who “lays down his life for the sheep” (John 10:11). What do I mean? So, then, Peter is a shepherd, and a good one; nothing, of course, like the Shepherd of shepherds in power and goodness, yet a shepherd and a good one, nonetheless, and so are others of his kind good shepherds. Anyone who has followed the Papacy of Pope Benedict XVI – both in deed and in word – will know that he, too, is a good shepherd, for he, like Peter, has given his life for the flock. He is a man who has given his life to Jesus Christ and who wishes to lead others, as a shepherd does, to Jesus Christ and for this reason he is coming to us. Yes, Christ is the face of God present among us. Through him, our lives reach fullness, and together, both as individuals and peoples, we can become a family united by fraternal love, according to the eternal plan of God the Father… I shall also bring the message of Christian hope to the great Assembly of the United Nations, to the representatives of all the peoples of the world. Indeed, the world has greater need of hope than ever: hope for peace, for justice, and for freedom, but this hope can never be fulfilled without obedience to the law of God, which Christ brought to fulfillment in the commandment to love one another. He comes to rekindle in us the hope we have in Christ the Good Shepherd. the shepherd was generally an expression of the dream of a tranquil and simple life, for which the people, amid the confusion of the big cities, felt a certain longing. Now the image was read as part of a new scenario which gave it a deeper content: “The Lord is my shepherd: I shall not want... Even though I walk through the valley of the shadow of death, I fear no evil, because you are with me.” (Psalm 23:1, 4). The true shepherd is one who knows even the path that passes through the valley of death; one who walks with me even on the path of final solitude, where no one can accompany me, guiding me through: he himself has walked this path, he has descended into the kingdom of death, he has conquered death, and he has returned to accompany us now and to give us the certainty that, together with him, we can find a way through. The realization that there is One who even in death accompanies me, and with his “rod and his staff comforts me”, so that “I fear no evil” (cf. Psalm 23:4) — this was the new “hope” that arose over the life of believers. It is this hope that the Holy Father will bring to us. In his message for the 45th World Day of Prayer for Vocations, which we also celebrate today, Pope Benedict XVI reminds us, “Vocations to the ministerial priesthood and to the consecrated life can only flourish in a spiritual soil that is well cultivated.” This is true not only of religious vocations, but of vocations to marriage and of families, as well. Let each of us, then, listen to the words of the Holy Father as he brings to us the message of Christ our hope. Let us pray that, through his Apostolic visit, the soil of our hearts might be well cultivated so that we might yield a rich harvest for the Lord. Amen! Pope Benedict XVI, 8 April 2008. Saint Augustine of Hippo, Homily for the Second Sunday After Easter, 4. In Philip T. Weller, Selected Easter Sermons of St. Augustine (St. Louis, MO: B. Herder Book Co., 1959), 186. 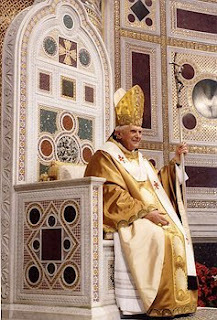 Pope Benedict XVI, Spe salvi, 6. Pope Benedict XVI, Message for the 45th World Day of Prayer for Vocations, 3 December 2007, 8.